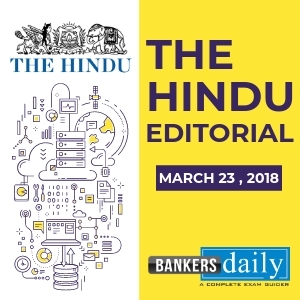 THE HINDU EDITORIAL – July 17, 2018 is one of the must read for the competitive exams like SBI PO Mains , SBI CLERK Mains Exam, BOB PO Manipal Online Exam. These topics are widely expected to be asked in the reading comprehension , Cloze Test or in Error Detection topics in the forthcoming exams. So gear up for your Exam preparation and learn new words daily. The Centre has announced the constitution of a committee to revisit several provisions of the Companies Act, 2013 that impose stiff penalties and, in some cases, prison terms as well, for directors and key management personnel. 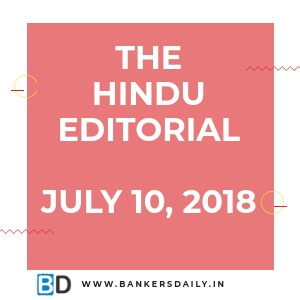 The 2013 law entailed the first massive overhaul of India’s legal regime to govern businesses that had been in place since 1956 and was borne of a long-drawn consultative process. Now, this 10-member committee appointed by the Corporate Affairs Ministry has been tasked with checking if certain offences can be ‘de-criminalised’. The panel, which includes top banker Uday Kotak, has been given 30 days to work out whether some of the violations that can attract imprisonment (such as a clerical failure by directors to make adequate disclosures about their interests) may instead be punished with monetary fines. It will also examine if offences punishable with a fine or imprisonment may be re-categorised as ‘acts’ that attract civil liabilities. Importantly, the committee has also been asked to suggest the broad contours for an adjudicatory mechanism that allows penalties to be levied for minor violations, perhaps in an automated manner, with minimal discretion available to officials. In fact, some of the provisions in the law are so tough that even a spelling mistake or typographical error could be construed as a fraud and lead to harsh strictures. The government hopes such changes in the regulatory regime would allow trial courts to devote greater attention to serious offences rather than get overloaded with cases as zealous officials blindly pursue prosecutions for even minor violations. The decision to build in harsh penalties and prison terms for corporate misdemeanours in the 2013 law was, no doubt, influenced by the high-pitched anti-corruption discourse that prevailed in the country at that moment in time. Apart from several cases of crony capitalism that had come to light during the second UPA government, massive corporate frauds reported at once-revered firms such as the erstwhile Satyam Computer Services had spooked investors and other stakeholders about the credibility of corporate India’s books and governance standards. When the NDA came to power in May 2014, a comprehensive review of the Companies Act was at the top of industry’s wish list as a means to revive the economy. Industry captains had red-flagged the impact of such provisions on the ease of doing business, and investor sentiment in general. A trust deficit between industry and government owing to stray incidents of corporate malfeasance should not inhibit normal business operations, they had argued. Four years down the line, the government is finally moving purposefully on this, a rethink perhaps triggered by the fact that private sector investment is yet to pick up steam and capital still seeks foreign shores to avoid regulatory risks. One hopes this is followed up on swiftly, before the ruling party slips into election mode. Russia 2018 may not, as FIFA president Gianni Infantino delicately put it, have been “the best World Cup ever”, but there is no denying that it was among the most entertaining. The final was a snapshot of the tournament as a whole: a thrilling spectacle featuring surprises, errors, and loads of goals. There was no single outstanding team but France, which secured its second World Cup, was the best of the lot over the five weeks. The French — coached by Didier Deschamps, who won the trophy as a player in 1998 and now emulates Mário Zagallo and Franz Beckenbauer — did not exactly play beautiful football. Often, they appeared workmanlike and conservative despite the frightening depth of talent. But they were efficient, organised, and clinical when it mattered, downing a doughty, unlucky Croatia at the final hurdle. For all the criticism of his methods, the plain fact is that Deschamps achieved the ultimate objective. Kylian Mbappe, who at 19 became the youngest to score in the World Cup final since Pele, showed glimpses of his extraordinary potential; he now looks set for greater things. France’s victory also shone a spotlight on the nation’s diversity, with players of African descent making up over half the squad. “There are different origins but we are all united,” Antoine Griezmann said after the final. “That is the France we love.” This was a World Cup of shocks: Germany crashed out in the opening phase for the first time since 1938, Spain and Argentina faltered in the round-of-16, and Brazil in the quarterfinals. Teams built around superstars struggled, with Lionel Messi and Cristiano Ronaldo exiting before the last eight, while the likes of Croatia and Uruguay, which relied on collective spirit, advanced farther than expected. For Croatia, marshalled by the excellent Luka Modric, there is no disgrace in defeat. The nation’s relationship with its football team — and Modric in particular — is a complicated one, and has its roots in a corruption scandal involving a powerful former administrator. But on the pitch, the East European side showed great resilience. Russia 2018 will also be remembered for the home team’s spirited run to the quarterfinals, with the whole nation caught up in the euphoria. Russia put on a great show as host, its people warm and welcoming as fears of racist behaviour proved unfounded. The baton has now been handed over to Qatar, which in 2022 will host a winter World Cup for the first time. FIFA has approved the expansion of the World Cup to 48 teams in 2026, a decision that has divided opinion. As he celebrates the success of Russia 2018, Infantino has much to think about. Meaning: A thorough examination of machinery or a system, with repairs or changes made if necessary. Meaning: Intended to give professional advice or recommendations. Meaning: Assign a task to. Meaning: Make a formal judgement on a disputed matter. Meaning: Interpret (a word or action) in a particular way. Meaning: A statement of severe criticism or disapproval. Example: The strictures of the United Nations have failed to have any effect on the warring factions. Meaning: Having or showing zeal. Meaning: Have an influence on. Meaning: Be widespread or current in a particular area or at a particular time. Meaning: An economic system characterized by close, mutually advantageous relationships between business leaders and government officials. Meaning: Feel deep respect or admiration for (something). Meaning: Give new strength or energy to. Meaning: To start thinking or talking about a different subject from the one you should be giving attention to. Example: I think we’ve strayed too far from our original plan. Meaning: To start working or producing at a faster rate or more effectively. Example: After a slow start, the project began to pick up steam. Meaning: A shot in soccer or hockey taken quickly with little backlift. Meaning: A visually striking performance or display. Meaning: Match or surpass (a person or achievement), typically by imitation. Meaning: Showing efficient competence but not inspiration. Meaning: Making someone afraid or anxious; terrifying. Meaning: Very efficient and without feeling; coldly detached. Meaning: A quick idea or understanding of what something is like; a brief insight or indication. Example: This biography offers a few glimpses of his life before he became famous. Meaning: Be very talented or perform very well. Meaning: Intense scrutiny or public attention. Meaning: To lose in a sports competition when you were expected to win. Example: He crashed out of the French Open in the second round. Meaning: Lose strength or momentum. Meaning: Assemble and arrange (a group of people, especially troops) in order. Meaning: Loss of reputation or respect as the result of a dishonourable action. Meaning: The capacity to recover quickly from difficulties; toughness.